Substance use and mental health: preliminary surveillance findings from an American Indian population. Citation: Kelley A, Andreini M. Substance use and mental health: preliminary surveillance findings from an American Indian population. J Public Health. 2017;1(2):56-60. Copyright: © 2017 Kelly A, et al. This is an open-access article distributed under the terms of the Creative Commons Attribution License, which permits unrestricted use, distribution, and reproduction in any medium, provided the original author and source are credited. Substance use and mental health disorders have increased in the last 15 years and impact public health. Public health surveillance of substance use and mental health (SUMH) is needed to inform planning, implementation, and evaluation of SUMH programs and policies. American Indian populations experience some of the most severe health disparities related to SUMH; however, American Indian populations are often excluded in federal, state, and county SUMH surveillance activities. These results in a gap in knowledge about prevalence, intervention, and policy needs related to SUMH among American Indian populations. To address this gap, the Rocky Mountain Tribal Epidemiology Center (RMTEC) implemented a 1-year pilot study to examine SUMH surveillance in American Indian populations. The main objectives of this pilot study were to: 1) determine what kinds of SUMH surveillance is occurring in communities served by the RMTEC, and 2) document the strengths and challenges of SUMH surveillance in this population. Using an evaluative case study design, the authors used a mixed-methods approach to examine multiple data sources. A conceptual framework guided the analysis process. Results indicate that limited SUMH surveillance is occurring in communities and programs served by RMTEC. Of the 18 SUMH recommended indicators, only eight are indicators are available for American Indians. Challenges and strengths are identified along with recommendations for future SUMH surveillance in American Indian populations. Mental health, Morbidity, Public health practices. Substance use and mental health (SUMH) disorders have increased in the last 15 years . Morbidity and morbidity related to SUMH is a major concern and impacts nearly every aspect of society including families, communities, justice systems, health care systems, and schools. To address increases in SUMH public health professionals are using public health surveillance strategies. Public health surveillance is the on-going, systematic collection, analysis, and interpretation of health data, essential to the planning, implementation, evaluation of public health practices, closely integrated with the dissemination of these data to those who need to know and linked to prevention and control . Public health organizations use surveillance to document impacts of an intervention, monitor the epidemiology of health problems, and set priorities, policies, and strategies . In 2015, the Council for State and Territorial Epidemiologists (CSTE) developed SUMH surveillance indicators for state and local public health departments (Table 1). The main of objectives of this pilot study were to: 1) determine what kinds of SUMH surveillance is occurring in communities served by the RMTEC and 2) document the strengths and challenges of SUMH surveillance in this population. 1. Adult binge drinking prevalence. 6. Drug overdose mortality rate. 11. Suicide death rate. 2. Youth binge drinking prevalence. 7. Hospitalization rate associated with all drugs, versions A and B. 12. Hospital discharge rate for mental disorders. 3. Alcohol-related crash death rate. 8. Prescription opioid sales per capita. 13. Emergency department visit rate for intentional self-harm. 4. Liver disease and cirrhosis death rate. 9. Prevalence of dependence on or abuse of drugs or alcohol in the last year – summary. 14. Prevalence rate of youth suicide attempts. 5. State excise taxes on alcohol. 10. Prevalence of use of selected prescription and illicit drugs. 15. Prevalence rate of past-year major depressive episode. 16. Prevalence rate of past-year serious mental illness. 17. Prevalence rate of past-year any mental illness. 18. Prevalence rate of frequent mental distress (≥ 14 days out of 30). Table 1: Recommended substance use and mental health indicators. Since 2015, states, federal agencies, and local health departments have utilized recommended SUMH indicators to document prevalence, evaluate interventions, and inform policy. Examples of SUMH surveillance in practice include the systematic collection and analysis of prescription drug overdoses . SUMH surveillance shows that prescription opioid overdose deaths have quadrupled in the United States from 1999 to 2015 . Examples of federal SUMH surveillance include the 2012 National Survey on Drug Use and Health indicates that more than 52.2% of adults have mental illness, substance abuse/dependence or chronic medical conditions . Examples of state initiated SUMH surveillance activities include the Behavioral Health Risk Factor Surveillance System (BRFSS), public health assessments, and behavioral health and substance use epidemiology programs. States and local health departments often use surveillance results to inform policy, intervention, programming, and funding. Tribal public health departments are located throughout the United States and are generally located on American Indian reservations and receive limited funding through the Indian Health Service, grants, third-party reimbursement, and tribal funds. Tribal public health programs are not included in federal, state or county SUMH surveillance activities. This creates a gap in much needed SUMH surveillance for American Indian populations who experience some of the most severe SUMH health disparities. American Indians and Alaska Natives are more likely to be diagnosed with past 12 month DSM-5 Drug Use Disorder and Lifetime DSM 5 Drug Use Disorder (AIAN 12-month 6.9% vs. White 12-month 3.7% and AIAN Lifetime 17.2% and White Lifetime 10.8%) . American Indians have the second highest suicide completion rate in the nation (AFSP, 2017) and experience trauma, abuse, violence, discrimination, and limited access to treatment ‒ these contribute to SUMH disorders and underscore the need for SUMH surveillance. Tribal Epidemiology Centers (TECs) play an important role in the SUMH process by bringing tribal, state and federal epidemiology resources together for data sharing, dissemination, and best practices. TECs are often the only public health authority in the region. This case study highlights efforts of the Rocky Mountain Tribal Epidemiology Center (RMTEC) to examine 18 indicators for SUMH surveillance among American Indians living in two states in the Rocky Mountain Region. This evaluative case study highlights the process, challenges, and recommendations for building a comprehensive tribal SUMH surveillance system. The RMTEC is located in a rural northern state serving more than 72,000 tribal members from eight reservations and five urban Indian health programs. Reservations are considered a Medically Underserved Area (MUA) and limited public health oversight at the reservation level contributes to health inequalities. Health disparities in these communities include higher rates of mortality from unintentional injuries, cancer, heart disease, stroke, infant mortality, and diabetes. American Indians in this region have a life expectancy that is 20 years less than non-natives in this region . These communities suffer from substance abuse use and mental health disorders that could be alleviated through effective prevention and control informed by SUMH surveillance. Tribal leaders identified SUMH surveillance as a priority in 2016. The RMTEC designed a 1-year pilot study that was funded by the CSTE in October 2016. A four person team led this effort including the RMTEC Director (second author), a RMTEC consultant (first author), a RMTEC staff member, and a tribal chemical dependency program director. The objectives of this 1 year pilot study were to: 1) determine what kinds of SUMH surveillance is occurring in communities served by the RMTEC, and 2) document the strengths and challenges of SUMH surveillance in this population. The team selected an evaluative case study design because it allowed for examination of existing SUMH data within the context of SUMH surveillance in American Indian populations. Consistent with the evaluative case study design, the team examined multiple data sources to meet the goals of this pilot study and examine the phenomena resulting from the study . Following qualitative case study guidelines, a conceptual framework was developed to identify what data sources would be included in the study to meet the objectives . This framework supported the examination of multiple data sources that allowed for further analysis by the lead author. Following the recommendations of Stake , the lead author categorized events and statements in the data to meet the objectives. Results were validated with team members and program staff (Figure 1). Figure 1: Evaluative SUMH case study framework. Evaluative case study designs require comprehensive data sources . In this case study the team used multiple sources of information, including observations, surveys with tribal and urban Indian programs, quarterly reports submitted to the funding agency, unstructured open ended interviews with team members, notes, existing data from state and RMTEEC sources, site visit summaries, tribal program reports, meeting minutes, observations, CSTE annual conference presentation, and various communications (Table 2). Surveys with tribal and urban Indian programs, existing SUMH data and interviews with program staff and programs served as the primary data sources. Objective 1: Determine what kinds of SUMH surveillance is occurring in communities served by the RMTEC State SUMH indicator survey data 2016 (primary and secondary data sources). RMTEC morbidity and mortality data menu for SUMH. Prevalence rates. Comparison of American Indian vs. All State Population. Descriptive statistics. SPSS Version 24.0 Written reports that highlight preliminary findings. Meetings with State. Work with State and tribes to populate missing SUMH indicators for American Indian. Focus on 13 tribal priority areas. Objective 2: Document the strengths and challenges of SUMH surveillance in this population Three meetings with CD program directors. Four teleconference meetings with CSTE program officer. Six completed surveys to CD directors. Eight copies of meeting minutes. Five interviews with staff. Three CD meeting agendas. Data files from interviews and documents. Data organized by categories and framework. Qualitative data analyzed using NVivo version 11.0 Confirmed results with RMTEC, state, and CD directors. Oral presentation at annual CSTE conference. Oral presentation CD meeting. Build on the strengths. Use the best available data. Provide timely reporting of SUMH to tribal leaders and CD directors. Table 2: Summary of data sources used to meet objectives. Qualitative content analysis methods were used to examine the data [11-13]. Using an inductive approach, the first author used open coding techniques to code the data. Then data were grouped and categorized according to themes focusing on strengths and challenges of SUMH surveillance using NVivo version 11.0. Next the data were abstracted and results from the analysis process were shared with tribal program staff and programs as a way of validating results. Their feedback was incorporated into the results and recommendations. The final step in the analysis process was writing up the results and identifying a course of action for future SUMH surveillance. Multiple themes emerged from the data analysis processes that were then organized by objective. Using CSTE’s 18 SUMH indicators and three categories of alcohol, other drugs and mental health, the team found that limited SUMH surveillance is occurring in communities and programs. Survey results (N=6) from programs indicate that SUMH data is collected through three different electronic databases. Programs report that limited data analysis and reporting is occurring in a systematic way. Some programs have funding that requires monthly reporting to a state or federal agency. Others conduct surveys for past and present clients; however, no policies or resolutions were in place among programs for SUMH surveillance or data sharing. Programs identified 13 priorities for SUMH surveillance from the 18 CSTE indicators, these are in rank order and include: binge drinking among youth and adults, liver disease and cirrhosis death rates, drug overdose morality, alcohol related crash deaths, hospitalization rates associated with drugs, prevalence of dependence, prevalence of prescription drug use, prevalence of youth suicide, suicide death rates, emergency department visits for self-harm, major depressive episodes, serious mental illness, and any mental illness. The team used existing data provided by the state behavioral health epidemiology department to examine which of the 18 CSTE SUMH surveillance indicators were available for American Indians at the state level. Data show that only eight of the indicators are available for American Indians (Table 3). Data Available for American Indians? Table 3: CSTE SUMH Indicators and surveillance data. The secondary objective was to document the strengths and challenges of SUMH surveillance in this population. Using qualitative content analysis methods  the authors identified the following themes related to the strengths of SUMH surveillance: program and RMTEC support of SUMH surveillance, partnerships with the state, federal, and local SUMH programs that could support future SUMH surveillance and data sharing, and high visibility of SUMH among tribal leaders, policy makers, and funding agencies. Themes relating to challenges were also identified the qualitative content analysis process. These include limited funding, limited access to data, and incomplete surveillance of SUMH indicators. The most common theme in the data related to limited funding to support SUMH surveillance. Currently the state, tribes, and the RMTEC do not have funding to support SUMH surveillance. This result in limited personnel available to conduct SUMH surveillance and build the necessary partnerships with tribes, states and local programs implement surveillance systems. Another challenge that emerged from the data was limited data access, data sharing agreements, resolutions, or memorandum of understandings that could support future SUMH. Through this process, the team documented incomplete surveillance of SUMH at the state level for American Indian populations. Of the 18 CSTE SUMH indicators, 16 are necessary for American Indian populations, but only eight of these indicators are available through existing state surveillance activities. In some instances, American Indian baseline data are not reported due to confidentiality or less than 10 cases. The prescription drug monitoring program data is not accessible. There is limited hospital discharge data on American Indian populations ‒ currently hospitals do not collect any information on American Indian status or other race classifications. The results from this study are important first steps towards developing SUMH surveillance in American Indian populations through partnerships with tribal epidemiology centers like RMTEC, states, tribal programs, and federal agencies. However, due to the nature of the evaluative case study design, there are limitations that must be noted. First, these results do not offer a full description of SUMH surveillance for American Indian populations or states and programs involved in this study. Second, this study represents a single case and should not be generalized to other populations or regions . Developing SUMH surveillance capacity and systems requires an understanding of the data available and systems used to implement surveillance. This evaluative case study allowed the RMTEC to explore the kinds of SUMH surveillance that is occurring in American Indian populations in the region. Prior to the CSTE pilot study, the RMTEC was not aware of SUMH surveillance indicators and data available. This process increased the visibility of SUMH data available, strengthened partnerships between the RMTEC, states, and tribal programs, while providing a foundation for future SUMH work. 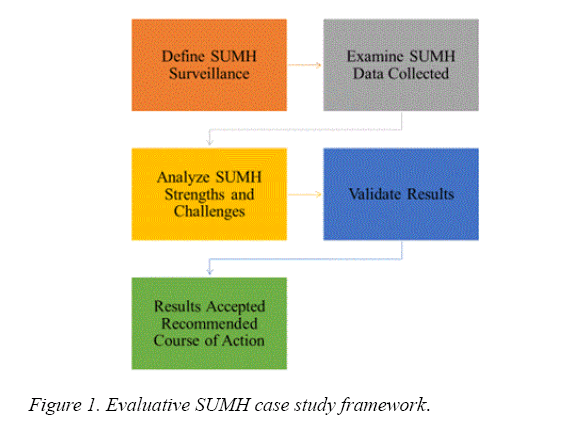 The results of this evaluative case study highlight the strengths and challenges of SUMH surveillance. Strengths identified through this process indicate a high-level of support and readiness for SUMH surveillance at the tribal, state, and local level. Challenges identified underscore the need for improved SUMH surveillance to accurately examine morbidity and morbidity related to SUMH in American Indian populations. Additional efforts are needed to ensure that data available from states and federal agencies are communicated to tribal programs and tribal health leaders in a systematic manner. Dissemination of SUMH surveillance results is necessary for the prevention and control of SUMH in this population. Through this process the team learned that funding, data access and sharing, and increased SUMH surveillance are needed to reverse increases in substance use and mental health disorders. Without comprehensive surveillance, it is difficult to monitor the impacts of interventions, set priorities, policies, and strategies to improve the health and wellbeing of American Indian people and communities. Council for state and territorial epidemiologists. Recommended CSTE surveillance indicators for substance abuse and mental health. 2016. Thacker SB, Qualters JR, Lee LM. Public health surveillance in the United States: Evolution and challenges. MMWR. 2012;61:3-9. World Health Organization. Health topics. Public health surveillance. 2017. Han B, Compton WM, Blanco C, et al. Prescription opioid use, misuse and use disorders in US adults: 2015 National Survey on Drug Use and Health. Ann Intern Med. 2017;167(5):293-301. Walker ER, Druss BG. Cumulative burden of comorbid mental disorders, substance use disorders, chronic medical conditions, and poverty on health among adults in the USA. Psychol Health Med. 2017;22(6):727-35. Grant BF, Saha TD, Ruan WJ, et al. Epidemiology of DSM-5 drug use disorder: Results from the National Epidemiologic Survey on Alcohol and Related Conditions–III. JAMA Psychiatry. 2016;73(1):39-47. Montana Department of Public Health and Human Services. Montana primary care needs assessment. Primary care office. 2016. Zainal Z. Case study as a research method. Jurnal Kemanusiaan. 2017;5:1. Baxter P, Jack S. Qualitative case study methodology: Study design and implementation for novice researchers.Qual Rep. 2008;13(4):544-59. Stake RE. The art of case study research. 1995. Kelley A, Snell B, Bingham D. Peer recovery support in American Indian communities: A qualitative intrinsic case-study approach. J Groups Addict Recov. 2015;10(3):271-86. Elo S, Kyngäs H. The qualitative content analysis process. J Adv Nurs. 2008;62(1):107-15. Winston T. Introduction to case study: The qualitative report. 1997;3:2. American Foundation for Suicide Prevention. Suicide statistics. 2017.